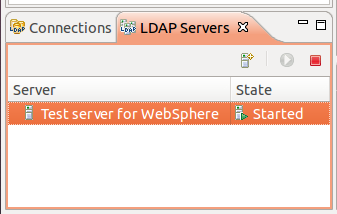 This article explains how to quickly configure WebSphere with Apache Directory Server (ApacheDS) for LDAP authentication. We will use the ApacheDS server that comes packaged with Apache Directory Studio. This has the advantage that we only need a single tool to set up the LDAP server and to populate the directory. Obviously the setup described here is not meant for production uses; the goal is to rapidly create a working LDAP configuration for testing purposes. It is assumed that the reader is familiar with configuring security (and in particular standalone LDAP registries) in WebSphere. No prior experience with ApacheDS is required. Download, install and start Apache Directory Studio. The present article is based on version 2.0.0-M8, but the procedure should be similar for other versions. Create a connection to the server. To do this, right click on the server and choose "Create a Connection". The new connection should then appear in the "Connections" view. Double click on the connection to open it. You should see the following entries in the "LDAP Browser" view: dc=example,dc=com, ou=config, ou=schema and ou=system. 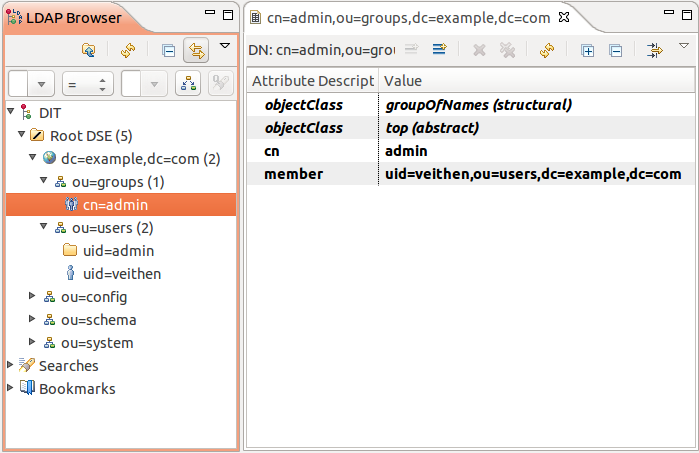 Create two entries with RDN ou=users and ou=groups under dc=example,dc=com, both with object class organizationalUnit. For each test user, create an entry with object class inetOrgPerson under ou=users. For the RDN, use uid=<username>. Then fill in the cn and sn attributes (cn is the common name which should be the given name plus surname; sn is the surname alone). Also add a userPassword attribute. Under ou=groups, create as many groups as needed. There should be at least one group that will be mapped to the administrator role in WebSphere. For the object class, one can use either groupOfNames or groupOfUniqueNames. They are more or less the same, but the former is easier to set up, because Directory Studio will allow you to select members by browsing the directory. For the RDN, use cn=<groupname>. When using groupOfNames, Directory Studio will automatically open a dialog to select the first member of the group. Additional members can be defined by adding more values to the member attribute. Also define a uid=admin user that will be used as the primary administrative user in the WebSphere configuration. Since this is not a person, but a technical account, you can use the object classes account and simpleSecurityObject to create this user. Note that the uid=admin user doesn't need to be a member of any group.